What could YOU do with 576 Square feet? Are you tired of cleaning off your car in the winter? Trying to find a place to put your yard tools or lawn mower? Has your basement become your catch-all? By adding a garage, you can have your basement back, all of your yard tools will have a home and more importantly, you won't be breaking your back next winter! And at this price, you won't be breaking the bank either! Excavation: includes excavation of existing site. We will use existing dirt for fill. Does NOT include extra fill or for ledge. All excess dirt to be spread on site. Frost wall foundation: includes 10''x18'' concrete footing with 48''x8'' foundation. Framing: 2X6 Walls, 2X10 rafters with 12" LVL ridge, 2X8 ceiling joists for a clear span (no lolly columns! ), 1/2" OSB sheathing for walls, 1/2" CDX fir plywood for roof sheathing and 2X10 for headers. 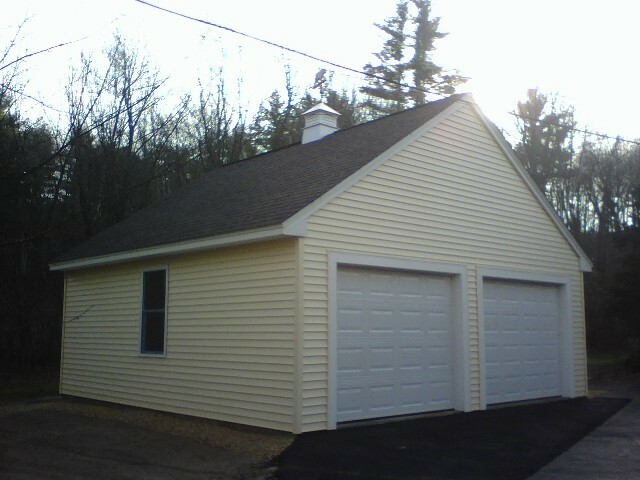 Garage Doors: Your choice of : 2= 9'X7' insulated raised panel garage doors OR 1= 7'X16' insulated garage door. Windows: 2= 30"X49" double hung vinyl windows. Door: 1= 9 light 2'8"X6'8 Door with lockset. Roofing: 30 Year architectural shingles. Vinyl Siding: House wrap for all walls. Vinyl siding to match your home as closely as possible with aluminum coverage for rakes and fascias. Azek trim around garage doors. Check out our other specials HERE! JWS Custom Decks can help you from design to completion. JWS only uses the best products in the industry. We use top brands such as Certainteed, Azek, Timbertech, IKO, Georgia Pacific, American Craftsman, John Mansfield. JWS also uses the best suppliers for all our materials. We get our #1 lumber from Mast Road Lumber and our roofing and siding from ABC Supply. Whether you are dreaming of building a detached garage, attached garage, home remodel, addition, 3 season porch, farmers' porch or deck, JWS is here to offer you craftsmanship and integrity along with affordability. Give us a call or e-mail to get started on your dream project today! ***IMPORTANT NOTICE***: All relationships are built on trust, therefore, JWS will NEVER share, disseminate or sell your personal information to ANYONE under ANY circumstances. Manchester, NH, Bedford, NH, Auburn, NH, Candia, NH, Deerfield, NH, Derry, NH, Londonderry, NH, Merrimack, NH, Salem, NH, Goffstown, NH, New Boston, NH, Dunbarton, NH, Concord, NH, Hooksett, NH, Loudon, NH, Raymond, NH, Hudson, NH, Hollis, NH, Suncook, NH, Pembroke, NH, Allenstown, NH, Epsom, NH, Windham, NH, Pelham, NH, Salem, NH, Epping, NH and surrounding towns. Remember JWS Custom Decks for all of your NH construction needs: Attached Garages, Detached Garages, Additions, Remodels, new construction, in-law apartments, pressure treated decks, mahogany decks, maintenance free decks, pool decks, farmers porches, sheds, roofing, siding, and so much more!! Call us today for your free estimate. Copyright JWSCustomDecks. All rights reserved.